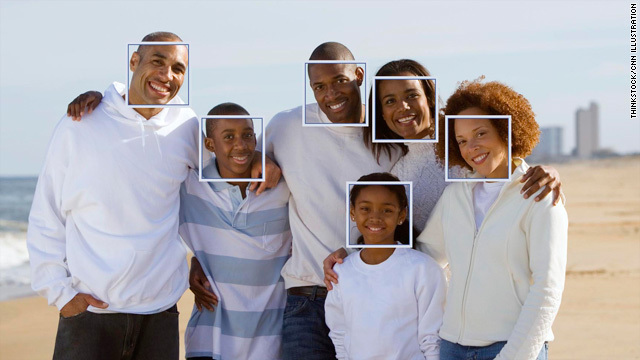 As shown in this photo illustration, software that recognizes or detects faces has been added to sites like Facebook and Picasa. (CNN) -- Most of the time, Stacey Schlittenhard finds facial recognition technology to be extremely useful. When she uploads her family photos to the website Picasa, for instance, the program automatically tags her friends and family members. This lets her share the photos easily and saves her hours of organization. But every now and then, the computer gets things flat wrong. "Babies," she says. "That's the hardest thing. All babies kind of look alike -- they all have little round faces. If I label one baby as my [2-year-old] son, it will label almost every baby as my son." In another instance, she said, Google's Picasa thought a lollipop was her friend. It's hard to teach a machine to know a human face -- and it's harder still to teach a computer to identify one face from any other. That may be comforting news for people worried about governments using facial recognition systems to surveil the public -- in effect, ending anonymity. Technologists say those ideas exist only in science fiction movies -- at least for now. "I don't think, currently, any facial recognition system is good enough for security purposes -- not even close, actually," said Yi Ma, an associate professor of electrical and computer engineering at the University of Illinois, and a visiting researcher at Microsoft Research in China. Using face recognition for surveillance or to identify people at borders and in airports has been tried in limited settings, Ma said, but it is at least a decade if not much further away from becoming real and reliable. Meanwhile, a handful of consumer apps are using available technology to detect faces in family and party photos -- where accuracy is not as important. On July 1, for example, Facebook announced it would give its users the ability to use facial detection software to select faces from photos on the site. Facebook's new feature only selects faces. It doesn't identify the people in photos by name. But in a blog post, Facebook product manager Sam Odio said that updates to this system will be coming. "Stay tuned for future posts about other work on browsing, uploading and tagging," he wrote in the post. Some photo tools go further than Facebook by identifying people in photos automatically. Face.com, a company that builds the face-recognizing software behind apps like Photo Finder and PhotoTagger, identifies friends in your photos by comparing them with similar shots on Facebook. The company's CEO, Gil Hirsch, said the goal is to make photo sharing fast. "Tagging the whole [photo] album -- let's say 200 photos -- takes less than 30 seconds" when using Face.com technology, he said. Google's Picasa and Apple's iPhoto perform similar functions. A Google test product called Goggles may also identify faces from mobile phones. Michael Sipe, vice president of product development at Pittsburgh Pattern Recognition, a Carnegie Mellon University split-off company that makes face-recognizing software and is funded in part by the U.S. military, said the family photo programs are a response to the hassles of curating digital photo collections. "In general, there's this tsunami of visual information -- images and video -- and the tools that people have to make sense of all that information haven't kept pace with the growth of the production of that information," he said. "What we have is a tool to help extract meaning from that information by using the most important part of that media, which is people." Anil Jain, a distinguished professor of computer science at Michigan State University, said it's still not easy, however, for computers to identify faces from photos -- mostly because the photos people post to the internet are so diverse. Computers get confused when a photo is too dark, if it's taken from a weird angle, if the person is wearing a scarf, beard or glasses or if the person in the photo has aged significantly, he said. Smiling can even be a problem. "The face is like a deformable surface," he said. "When you smile, different parts of the face get affected differently. It's not just like moving some object from one position to another," which would be easier for a computer to read. The easiest faces for computers to identify, tech researchers said, are those that are photographed in bright light, with the person facing the camera and wearing a "neutral expression" on his or her face. In general, facial recognition software works by comparing a picture or video of a face with a database of information about other faces. The software picks up on major facial features -- like the distance between a person's eyes or the location of his or her nose -- and looks for an adequate match. The software works more slowly and is thought to be less accurate when a large number of faces are compared, or when the source image is of low quality. Still, privacy advocates worry about the future of facial recognition technology. Marc Rotenberg, executive director of the Electronic Privacy Information Center, said the motives behind the technology are what worry him. Governments and corporations intend to use facial recognition software to track the public and to eliminate privacy, he said, noting that automatically identifying people in public in the U.S., when they are not suspected of a crime, could be a violation of constitutional rights. When facial recognition comes to surveillance cameras, which are already in place, "you're no longer racing through iPhoto to figure out how many pictures of Barbara you have," Rotenberg said. "You're walking around in public and facing cameras that know who you are. And I think that's a little creepy." He said governments should stop investing in facial recognition technology, and the U.S. government should consider regulating how such information is used. Some security systems that use facial recognition technology in crowds -- a difficult feat, technologically -- have been abandoned because they weren't accurate enough. Tampa, Florida, for example, tried in 2001 to use facial recognition technology in conjunction with security cameras to curb crime in a nightclub district called Ybor City. The program was abandoned in 2003 because it was ineffective, according to news reports. So, for now, facial recognition is mostly making inroads with shutter-happy consumers. Schlittenhard, who uses Picasa to track friends and family members in her photos, says that for now, these programs are a big help. "Nothing's perfect," she said of the fact that people and lollipops are sometimes misidentified by the free face recognition software. "I don't expect it to be a cure-all to all my tagging woes, but it makes processing a lot quicker."